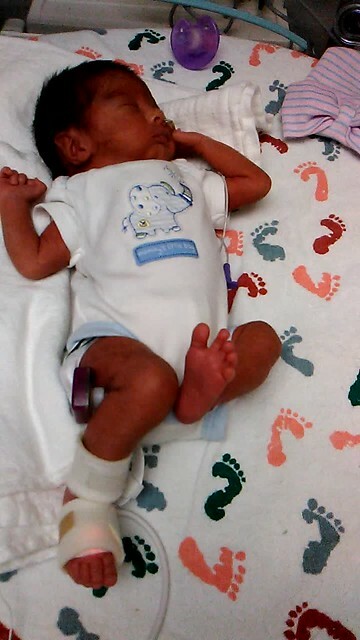 How's our little Kymani doing in the NICU? Find out what she's up to with the photos, info, and slideshows below. Kymani was fast asleep when we walked into her room this morning. She's always so cozy and cuddly. Our little fighter gained 50 grams again last night. Yay! Keep going so we can bring you home as soon as possible. Kangaroo care has still been extremely important for Kymani, as it helps regulate her body temperature, among many other physical and emotional benefits. During kangaroo care, it's important that her skin touches mine and that she is tucked inside any clothing, much like a kangaroo pouch. This puts her near my chest so that she can hear my heartbeat, but also stimulates important medical responses from both Kymani and myself. It has been scientifically proven that a baby needs to be near their mother as often as possible, especially in the moments and days directly following birth. Kangaroo care can also be done by daddy. It is just prioritized with the mother, due to the neurological and other responses. Though, there are some benefits to daddy doing kangaroo care and simply being with the baby, as well. We like to take turns as much as possible, being mindful of the health benefits, as well as what Kymani seems to want and need, and trying to follow a pattern that is in line with that. Here are some photos of Kymani sleeping peacefully after having a diaper change, temperature, feeding, and kangaroo care. She really needs the kangaroo care right now for the temperature regulation, as well as the regulation of her heartbeat and breathing. It's been evident from her monitoring that those things are better when she is getting held, especially when kangaroo care is involved. In the beginning, it was a struggle keeping Nova in the hospital room and keeping her busy and happy. She has been getting more used to "strangers" (aka nurses and other medical staff) coming in and out. Nova also likes to play and is finally learning that Kymani cannot join in the play yet. She likes interacting with Kymani and sitting in our laps peacefully and gently touching and talking to her sister. She has also started talking to and playing with the staff, rather than hiding or crying when they come in, which is very good. Here's a fun slideshow of all Nova. Here's a fun slideshow of Rich holding Kymani and talking to her. You can see how she pays attention to him. She really enjoys it when we talk to her and hold her. Kymani's goals still remain the same. Eat and grow, eat and grow, eat and grow! So, please continue to send us healthy, positive thoughts toward Kymani's growth and her progress on breastfeeding. She latches on every day, but is currently only able to suckle for a few seconds or so. This is actually more than most preemie babies do at her stage. So, she is already ahead, but we of course hope she keeps progressing so we can bring her home. Our little preemie Kymani has been progressing well in the NICU. What is she up to on June 22, 2017? Check out the photos, info, and video below to learn more. Kymani is 14 days old today! If we were still pregnant, her gestation age would be 32 weeks and 4 days. What progress she has made in just two weeks! She really wants to grow and get home with her family. Kymani gained 20 grams again last night. Yay! That puts her at 3 pounds and 5 ounces. Remember, that 1800 grams (or almost 4 pounds) is when she can progress to a couple other things, like an open crib and more serious attempts at breastfeeding. later. She also used the binky a bit during her feeding, which also helps her associate the suckling motion to getting her food. Remember, she is currently getting all of her nutrition (breast milk, human milk fortifier, and multivitamins) via gavage (a feeding tube). Babies born before 34 weeks don't generally suckle much or at all and may choke on the breast milk or formula. It's okay to practice breast feeding in small increments, as long as the baby does not get a large amount of milk in their mouth. We have been trained by the medical team on what to do and what not to do. Kymani was having a fun stretching moment after we held her this morning. This was right before she had her bath (see the slideshow below the video for photos). We aided in Kymani's first bath today! It was done inside of her isolette to keep her warm. Watch the slideshow below for a few of those moments. This is Kymani relaxing in my arms after her bath (photos below). We put her in a fresh new gray size preemie onesie. I think she really liked the bath...well, mostly. She did cry a little during part of the bath, but that's perfectly normal. She did seem to enjoy a good portion of it more than most babies do. Her favorite part was the shampooing and rinsing and drying of the hair. I think she liked the massaging motion. Below, in the first picture is Kymani right after being held by us and getting her diaper changed. She was very relaxed. The second photo (on the right) is when we left her room for the night (I think - you never know if we will go back in the middle of the night). We had gotten her all comfy again in a new position. She did have a small BRADY earlier today. But it wasn't anything to be concerned about. She is still progressing perfectly and the doctors keep pointing out that she really needs to just grow and eat on her own and both will come with a bit more time. P.S. Some of you may have noticed that her blue onesie says "mommy's little boy". One, it's super hard to find preemie clothing, so we take whatever we find. Two, we aren't the type to care about gender-specific roles, so this doesn't bother us. We believe in giving kids a variety and letting them make their own decisions in an unbiased environment. It is our belief that when you limit their choices, it can interfere with or influence their thoughts on things. So, we try to be as unbiased as possible so that they each develop their own personalities. For a preemie baby, Kymani is making a ton of progress every day. She's still in the NICU, but she's getting closer to going home each day she is in there. Each day when we walk into her room, she is in some sort of a cute pose. She moves around a lot, no matter how we or the nurses position her. This is a good thing, though. It means she is just being a newborn baby and doing what they do. Kymani is becoming a little less fragile daily and we are becoming more experienced with preemie care. We recently were taught how to take her out of her bed without assistance from the medical team. We have been doing this for days now. So, now we are able to take her out and put her back in on our own without asking. This is great because now it's on our time. We've been holding her a ton. We already were but now that we are in charge of that, it's of course more often. There weren't many changes for Kymani today because she is doing so well. She has her bed lowered to the lowest temperature possible until she weighs enough to be transferred to the open crib. She is technically ready but she's too small. She needs to weigh at least 1800 grams before moving, which is close to 4 pounds. So, send positive thoughts that she will do that fast. She was at almost 1600 grams today. Perhaps one of the biggest pieces of news today is that we are now in a boarding room that is very close to Kymani's NICU room, so we can see her whenever we want. We plan to stay until she gets discharged. We currently have enough to stay about a week, but are working on earning enough to stay longer, if necessary. In the photo to the left, this is Kymani when I got her all snug and we said goodnight last night. To close, we will leave you with this cute photo of Nova. To see what the heck she was doing, check out her blog (The Nova Skye Story) in a little bit for more photos and a couple videos. We definitely haven't forgotten about our Nova Bear. In fact, she's getting just a little bit of extra attention so that she knows we still love her too and everything isn't about just Kymani. Can you tell I've been down this road before with the other two sets? Our 6 kids are 19 and 18, 13 and 12, and 1 and 13 days. Every day that Kymani has been in the NICU, there have been new changes, mostly good. She is on the right path that will get her home, but she's not quite ready yet. Here's what we learned today. When we walked into her room this morning, Kymani was fast asleep, all cozy in a cute onesie with a butterfly on it. The late night nurse put it on her to keep her warm without a blankie because the blanket has been too hot. This is actually a good thing because it means she is regulating her own temperature and doesn't need the heating bed as much. That's actually one of the cool things we learned today. We had discussed that a little bit yesterday. But today, they said she is technically ready for the regular crib because the heat on her bed has been turned way down. But because she is so small, she still needs to be in the isolette just a little bit longer. She has to gain more weight first, which she has been doing. She gained 40 grams overnight, 50 grams the night before, and then 50 the night before that as well. So, she is moving along nicely. She is at 1460 grams and should be at about 1800 before being transferred to the regular (non-heated and open) crib. 1800 grams is almost 4 pounds. At the rate she is going, she should be there before we know it. Nova wasn't ready to be awake this morning, so she stayed in her stroller for a bit when we first came in. She wanted "Baby Ky" as she calls Kymani. So, she did eventually get out to have some fun. She of course also said the obligatory "baby play, baby play, baby play" a bunch of times. We are still working on getting her to figure out that Kymani can't play yet. We do let her sit in my lap while I hold Kymani so she knows they are both special. We tell Nova she is the big baby and Kymani is the little baby. Another cool milestone Kymani made today involves breastfeeding. Yesterday, we talked about how she has started rooting around, so we tried to let her do it for real today and she actually latched on and took a bit of milk. She then smiled and went to sleep, but that's huge progress for how young and tiny she is. Kymani really wants to come home. She isn't quite ready yet, but she seems very determined to get there. As you can see in some of the pictures, she is sucking on her hand. This is what she was doing when she couldn't root around to feed. The rooting is one of several reasons the nurses allowed her to go ahead and try breastfeeding a little today. Right now, it's mostly practice, but it's that practice that will get her closer to the real thing. Because she is gaining weight steadily, has no air support, has had a very low instance of BRADY events, her jaundice is going away, and she is almost ready to come out of the isolette, the main things that she needs to do before leaving is weigh at least enough to fit in an infant car seat (that's 4 pounds, for those who don't know) and also be breastfeeding without additional tube support. That means she is very close! We don't yet have an actual date because there is no way to predict that. However, she is making huge strides daily. She really wants to be with her family and the feeling is very mutual. Nova Bear has been as patient as we can expect a one-year old to be. Here she is watching Dave and Ava on the tablet with her blanket and bottle. She's only on the floor because she wanted to be. Babies. generously gifted enough for a night and a half, and we also got some gigs that will pay for the rest. That week will hopefully give us enough time to earn more for any additional nights needed. Boarding at the hospital is going to be so much more convenient. This means we really can see Kymani any time, 24 hours. Our boarding room is very close to her NICU room. We start boarding tomorrow and we are super excited. This will also be helpful when Nova needs a break. We won't have to leave the hospital and come back later. We can just go to our room until she is ready to visit again. Yay! We held her for a good number of hours today. But no one wants to leave their baby someplace without them. So, the boarding is going to be great. We have missed her so much and cried a lot every time we have to leave. Her medical team is awesome, but she needs her parents, too. When we first walked in the NICU room today, Kymani was fast asleep. As you can see, she was extremely comfortable. The nurses are all doing a great job taking care of her, as are the rest of the folks on her medical team. The tube you see in this picture is just her feeding tube. Kymani is eleven days old and is still doing very well. Her bilirubin went up slightly yesterday, but then it went back down today. If you haven't been keeping up or don't know what this means, it's in relation to jaundice. The lower the number, the better. If the numbers go up to a certain point, she will need to get phototherapy (light therapy) again. Her stools still look great and there has still been no further need for glycerine suppositories. She has had no BRADY events since June 15 - so 4 whole days without them! - that is awesome progress for a preemie baby this young. Kymani also has started rooting, meaning she wants to breast feed. The nurse said we can try this tomorrow. She's very small, but because she has been sucking her binky (pacifier) very well and has been trying to root a bit, this is a good idea. She tried here and there before, but today, she tried very hard to do so and even got frustrated when she couldn't. The most important things that need to happen before she goes home include being able to feed properly without the tube, gaining weight properly, and getting the bilirubin levels low enough. Prior to that, she also had to be off of breathing support (she has for some time now), stool without suppositories, and not have any BRADY events. As you can tell, she is getting very close. So, the goal that we have to personally work on is getting her to feed properly. Obviously, the nurses will be helping with that, as you never know whether a preemie is ready or not until you try. We are looking forward to trying out breastfeeding tomorrow without the aid of the pump and tube. We will see how she does. Don't worry, if she doesn't take to it the first try, it's okay. Most babies born as early as she was are unable to do this. So, if she does, it will be a nice surprise. Another piece of big news is that she may be graduating to a regular crib instead of the isolette. To do this, babies need to be able to regulate their own temperature, among a few other things. The temperature on her isolette has been getting turned down lower and lower each day, meaning she doesn't need as much aid with staying warm. This is very good. Each day with a preemie baby is full of milestones, new information, and sometimes even setbacks, but not always. Each day holds a new plan, so you never know what to expect. We don't yet know when she will be able to go home. But we do know she is making great progress each day. Since our vehicle has broken down to a state that would cost more to repair than the vehicle itself is worth, we will be looking into the boarding available to NICU parents tomorrow. We can't ask or expect anyone to drive us back and forth as much as we need to be there. Love, kangaroo care (skin-to-skin therapy), and her parents and siblings spending time with her is one of the most important factors in her healing process. There is a nightly fee for the boarding, but we do have two free nights courtesy of the hospital, we got a little bit of extra work to help, and a friend was generous enough to help out with enough for a night and a half. We will just keep looking for extra web-related work and/or try to sell enough crafts to keep the boarding going until she is able to come home because she really needs us there. All positive vibes toward her coming home as soon as healthily possible are really helpful because obviously, the best possible scenario is that she is at home, rather than in the NICU. Again, with preemies, it is hard to pinpoint an exact time when that will happen, but all good thoughts toward her being ready soon are very helpful. Until tomorrow, we will leave you with this cute photo of Nova playing peek-a-boo with a nurse in Kymani's NICU room. This is her favorite game and since we are working on her communication skills with people outside the family, it has been a great ice-breaker. Another cute thing Nova does is say "baby play" over and over while we are there. We are trying to get her to understand Kymani cannot play yet.